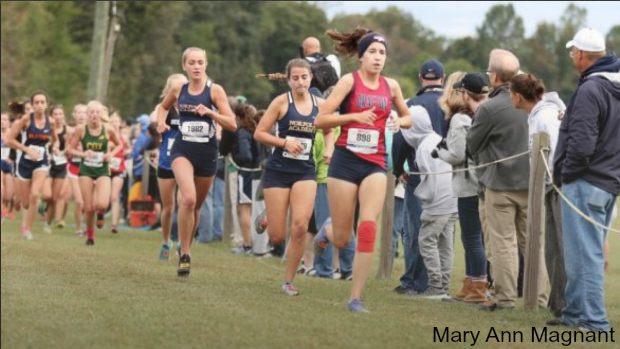 The Grafton girls' victory at Thursday's 4A Region championship wasn't much of a surprise. The Lady Clippers were favored, and in a systematic fashion, placed 1-3-5-7-9 to tally 25 points and claim the team trophy. However, the order of finishers was a bit surprising. Allison Kenney, seeded fourth on Coach Nick Valenti's team, outpaced three teammates, as well as the rest of the field to win her first region championship, covering the 5,000 meters of Eastern State Hospital terrain in 20:17.92. "I was very pleasantly surprised," said the modest winner after the race. "It was a good day to run, not too hot or too cold. I ran a really great race, and when I saw the opportunity (to win), I really pushed hard." And when did opportunity arise? "With about 800 (meters) to go." Kenney's final burst gave her a comfortable lead around the last corner, and put the senior 60 meters ahead of runner-up Kirsten Long of Jamestown (20:28) and teammate Kira Freedman (20:41). Grafton's other scorers, Alexa Daley (fifth - 20:53), Haley Rush (seventh - 21:04) and Allison Freedman (ninth - 21:39) helped the team to a 25-point finish, comfortably ahead of Jamestown (second with 45) and Lafayette (third with 115). The Rams' Alli Crookston rounded out the top five with a fourth-place individual finish (20:49), and Churchland's Tamara Washington was the first at-large (not in top three teams) qualifier with a sixth-place (20:56) effort. The Grafton boys also won the region title as Zachary Strum led a 3-5-9-11-14 Clipper charge for a low score of 42 points, just ahead of Jamestown (52) and Lafayette (62). However, it was Will Plante of Jamestown, whose strong finish showcased the race. Trailing Lafayette's Brenner Beard for the lead with just under 400 meters to go, Plante unleashed a furious kick that propelled him past the Ram and across the finish line with a seven-second triumph in 16:45.79. Plante has been a model of consistency for Coach Mark Tompkins this year. He opened his senior campaign with a win at the Newport News/Al Dorner Invitational and has maintained times of well under 17 minutes in each race this season, with a best of 16:09 at the MileStat Invitational. He credits Tompkins for developing a training program which is designed for a steady incline throughout the season, but adds another source for his success. "I also have to credit Coach (Kevin) Harper for the supplemental recovery routines he designed which has helped me to stay injury free throughout the season. We usually do a hip strengthening and rope stretching routine post-workout as well as barefoot strides, in order to build efficiency in our form." "(Plante) is very consistent in everything he has done this year," added Tompkins. "He has matured very nicely as a runner and holds himself to a high standard of personal discipline in athletics and in the classroom." Tompkins noted the irony in Plante having to pass Beard (16:52) for the win. "Both athletes are actually friends and trained together over the summer." Sturm placed the Clippers in 16:53, and was followed to the finish by Ben Madrigal (fifth - 17:17), Rowan Etheridge (ninth - 17:38), Dylan Raney (11th - 17:41) and Alex Murphy (14th-18:11). Smithfield's Johnny Babyak placed fourth in 17:11 to lead the five non-team qualifiers who will join the Grafton, Jamestown and Lafayette teams at next week's 4A championships at Great Meadow. In all, it was a great day for Coach Valenti's troops. "The team met my expectations," said Valenti. "Our goal was to win and to run comfortably going into next week."